.It is interesting to note that for several hundred years our ancestors did not move any great distance from the places THEIR ancestors were born, up to and including Grandpa John Yeo. 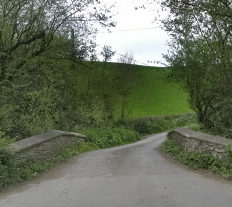 His birthplace, Bustley's Bridge, near Yarnscombe, North Devon, England is not many miles from Kings' Nympton, Beaford Parish, and other parishes in North Devon. 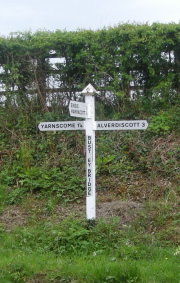 Through the years the families moved from Kings' Nympton, Hatherleigh, Highampton, High Bickington, Yarnscombe and, eventually to Bishop's Tawton. Our earliest confirmed ancestor, Bartholomew Yeo, son of Philip Yeo was born in Kings Nympton about 1600. Bartholomew married Zenobia Halse of Beaford Parish, March 20, 1624. There is evidence that we had an earlier ancestor, William atte Yeo who was sheriff of Devon. He fought for King Edward III of England during some of the battles of the Hundred Years' Wars, and was awarded a coat of arms by Edward III for his outstanding assistance during the Battle of Crecy. I am still waiting to get confirmation of the connection between William Yeo of 1346 and our (confirmed) ancestor, Bartholomew. When I get this connection solidified I will send additional information. Bartholomew had two sons, Andrew and Bartholomew. Our ancestor was Andrew Yeo of Beaford Parish who married Prudence Avery on the 4th February in 1678 in her parish of Highampton. It was the custom, and still is today, that a bride is married in her own parish. There are exceptions to this rule. 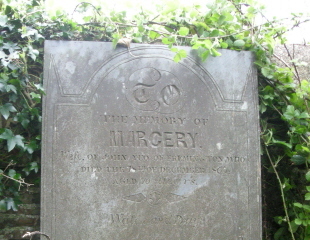 In our family Margery Stacey (B. 1799 in Merton Parish) was apprenticed at an early age to a family in Tawstock Parish where she was married. Records show that Andrew Yeo was buried 16 November, 1729 in High Bickington Parish. By referring to the Devon map you will get a better idea of the proximity of these parishes to each other. This couple (Andrew and Prudence) had eight children. Our ancestor, James Yeo was third eldest. He was baptised 7 May, 1682 in Hatherleigh Parish. The dates given in records are always baptismal dates. Sometimes both birth and baptismal dates are given. Usually the baptisms occurred within a short time of the birth, but occasionally a child was not baptised until he was a year old. There were many reasons for this; illness of the mother, distance to the Parish Church, or if the family was a farm family, perhaps the parents were too busy to take the time to get to the church for the baptism. However, if the child were sickly; perhaps not expected to live, baptism was done immediately. 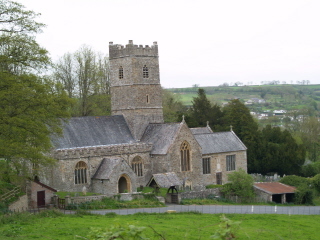 James Yeo was buried in Roborough Parish Church in 1763. 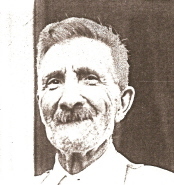 He may have lived in Roborough in later years with his son, Thomas. There were five children born to this couple: Margaret. John, Johanna, Ellenour and Thomas. Thomas, our direct ancestor was baptised on 11 October 1715 in Roborough Parish. He was married to Mary Davis of Atherington Parish, on 2 March, 1756. She was born in Atherington Parish on 2 Februc;iry, 1734, the daughter of Isaac Davis and Mary Brewer Davis of that parish. Because of the disparity in their ages, it is possible that she was Thomas' second wife. Thomas and Mary had six children; Eliner, Mary, Joanna, James , Jane and John. Our direct ancestor, was second eldest and was baptised 7 January 1759 in Atherington Parish. Daughter, Mary married James Tinson. John Yeo married Elizabeth Punchard, daughter of Richard Punchard, and Anne Huton Punchard of Atherington Parish, on 31 July, 1792. John was buried on 19 December, 1804 in Atherington Parish. His widow, who was born 3 July 1769 subsequently married Henry Kingsland, in 1809 .. He was a native of Atherington Parish, having been baptised there 30 June 1782. John and Elizabeth had four sons, John who married Marjery Stacey, Thomas who married Mary Manning, James who married Elizabeth Smith and William who married Jane Lang. Elizabeth Yeo Punchard died in Atherington Parish 16 April 1836 and is buried there. There were no children from the second marriage. Our ancestor, John Yeo was baptised 14 September 1793 in Atherington Parish. He married Marjery Stacey of Merton Parish, 3 April 1821. A certificate of Indentured Apprenticeship for Marjery Stacy recently came to light in the Devon Record Office in Barnstaple. Marjery was apprenticed at age seven to a Wiliam Cann, to learn "housewifely affairs" ... until she reached the age of 21 or was married, whichever came first. This certificate carefully outlines the benefits she would receive and what was expected of her as an apprentice. The certificate was witnessed by two church wardens. She served her apprenticeship in Tawstock Parish, and was married there instead of her birthplace, Merton Parish. She was the daughter of William Stacey and Elizabeth Stacey (maiden name Stacey). Marjery was baptised in Merton Parish 22 May 1799. This church played a part in the lives of our early ancestors. 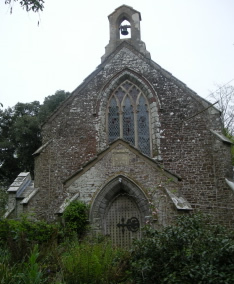 John married Margery Stacey here on the 3rd April, 1821 and their son John Yeo was baptised there on the 24th October, 1824 and was married in this church on the 31st December, 1851. John's wife's, (Elizabeth Brace) parents were associated with the church, her father George Brace was baptised there on the 12th May, 1793 and married there on the 6th November, 1814. Elizabeth Yeo nee Brace, was baptised there on the 25th June, 1820 and married there to John Yeo. There were six children born to John Yeo and Marjery Stacey Yeo. The first, William, was born in 1821 while the family was living in Coombe Cottage. This cottage is still standing although it has been slightly renovated through the years. It was likely a "tied" cottage, meaning that the use of it was one of the "perks" of the tenant farmer's job. He was entitled to live there as long as he was employed by the land owner. In addition to William, there were John, James and Thomas The two girls were Elizabeth and Mary. Later the two sisters married two Squire brothers- Thomas and William. James b. 1832 and Mary b. 1835 were baptised in the Ringash Bible Christian Chapel so this would explain why Margery was later buried in Hiscot Bible Christian Cemetery. On Margery's gravestone, which is curiously in an old Bible Christian Chapel cemetry in Hiscot, it states John was from Fremington. After Margery's death, John moved in with his daughter Mary and son in law Thomas Squires and in 1871 they were all living in Fremington. Our ancestor, John Yeo was the second born to this couple and was our Grandpa Yeo's father. He was baptised in Tawstock Parish 24 October, 1824. He married Elizabeth Brace of Tawstock Parish. ', who was baptised 20 June 1820. Her parents were Elizabeth and George Brace. Her mother's parents were Peter and Joan Mullis. Grandpa John Yeo was born (I have a copy of the birth certificate) 26th December, 1854. He was the second of the six children born to John Yeo and Elizabeth Brace Yeo. His elder brother, Harry was born in 1853. Other children were George, (not quite sure of date- but believe it was 1857), Mary Ann (Cousin Owen's Grandmother), born in 1859, Elizabeth born 1863 and Thomas, born 1864. All the children were baptised in Harrocot Church, which is now a private house. In 1851 they were living at Hiscott House which was next door, across the fields, to the Bible Christian Chapel where Margery was buried. The family lived in a simple farm home on the banks of a stream at Bustley's Bridge, near Yarnscombe Village, in Tawstock Parish. The building was a simple affair made of "cob"-a mixture of clay and straw. 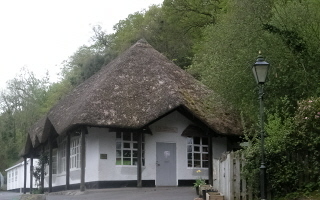 At one time it had a thatched roof. The picture I have of the home was taken following a fire which destroyed the thatched roof. Since "cob" must be kept dry, the cottage quickly disintegrated over a short period of time. It appears the structure was not repaired following the fire. Cousin Owen does not know the date of the fire, but he does recall seeing the shell of the building when he was a school boy. He took me into the area several times; heavily wooded and difficult to make any progress, we did find the remains of some walls and an area which we thought might have been the well. There are pictures in this book which will show the area. According to records, Grandpa's Father died here on the 2nd July, 1876. Grandpa's birthday, December 26, 1854 was undoubtedly another winter day in Southwestern England; more than likely it was overcast and possibly raining. However, the incidence of rain and the comparatively mild climate were two of the factors which contributed to the lush green meadowlands and the fine dairy products for which Devon is famous. Tawstock School, now Holywell County Primary School, where Grandpa John Yeo and his siblings attended classes. It is not far from the Bustley Bridge home. However during harvesting time he would have helped on the farm, which was why school long summer holidays were introduced. It was a sign of the times that children worked as soon as they were old enough to be of any help. Not until the 1870's were young children (until 1874 under nine years old, after that under ten) statutorily barred from all forms of wage-earning labor. Under ten-year olds were barred from underground employment in the mines by Ashley's Act of 1842. However, one imagines in the less populated rural areas, there was little checking done. Of the four boys born to Elizabeth Brace Yeo and John Yeo, Grandpa, Harry, George and Thomas all worked for various farmers. Grandpa worked for a time at Alscott Barton ("Barton" was the term used to indicate the largest farm in the area). In 1871 he was a farm servant on Alverdiscott Barton, working for farmer, Robert Cawsley. Grandpa and George and Harry moved to Wales and all worked in the mines before emigrating to America. Many thanks to Kaye for sharing this with us.